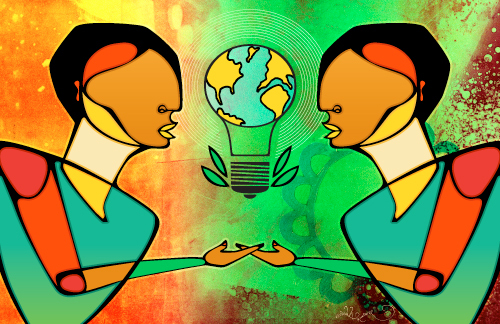 When Melanie Fornés found out she was the first woman of color to direct the annual Earth Summit in its 14-year history, she knew she needed to make the conversation about sustainability more inclusive for people of color. 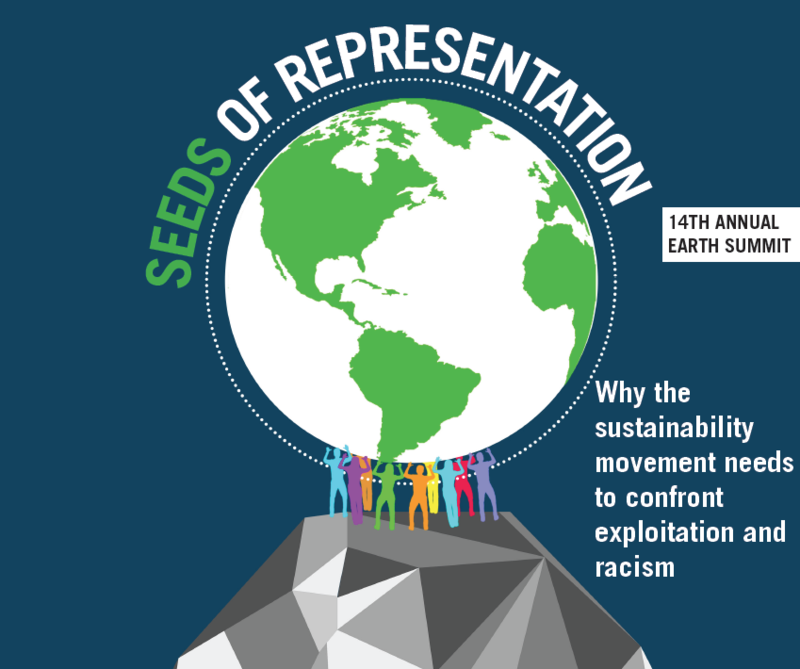 On April 24, the 14th annual Earth Summit fused activism and art with spoken word, a keynote speaker, sustainability-related workshops, student art, free food and the first People of Color Caucus. 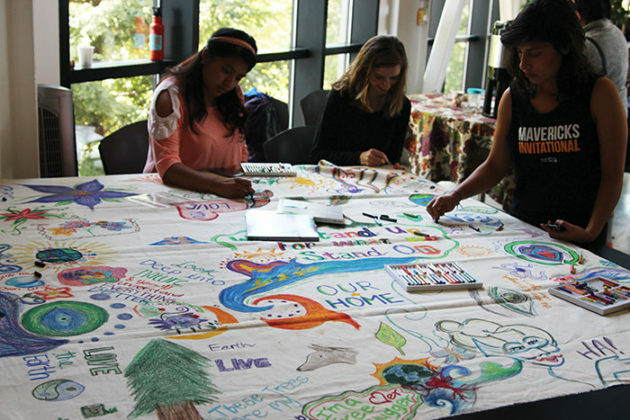 Students make their marks on a collaborative art piece about appreciation for the environment. Photo by Alexandria Moskow. Keynote speaker Favianna Rodriguez uses artistic activism to mobilize for social change. She often works with imagery of monarch butterflies to symbolize the right that living beings have to move freely. Photo by Alexandra Moskow. The student art gallery, a new addition to Earth Summit, displayed student work about endangered pumas and the delicate landscape of Joshua Tree National Park. Photo by Alexandria Moskow. 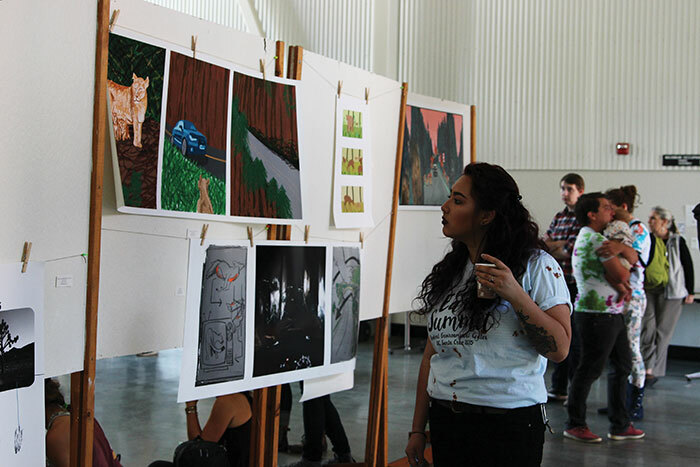 The Earth Summit serves as a celebration of the ‘Blueprint for a Sustainable Campus’ — a document updated annually at forums to bring together community members’ visions of sustainability at UC Santa Cruz. The summit showcases the history of sustainability on campus and provides a platform to brainstorm new project ideas for sustainability. SEC chose Favianna Rodriguez as this year’s keynote speaker because of her history in leading environmental justice movements through her artwork, which focuses on migration, patriarchy, economic injustice and female sexuality. 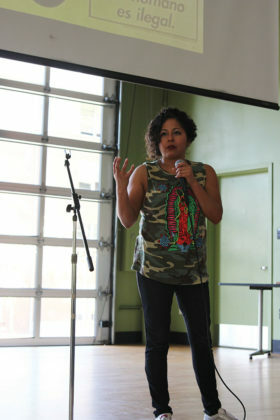 Rodriguez said that growing up, she never gained the tools and knowledge she needed to learn about her own sexuality. At 21, she had an abortion, but felt stigmatized to open up publicly. There’s a commonality between the fight for women’s equality and ecological devastation. The caucus was created as a collaborative effort between the SEC and the ethnic resource centers’ #POCsustainability campaign to bring people of color together to discuss disparities within the environmental movement on campus and showcase contributions people of color have made to the environmental movement. The caucus used alumna Cheslea Pack’s senior thesis on disparities in student perceptions and participation in the environmental movement at UCSC as a basis for the discussion. From statistical surveys, Pack found that out of 401 undergraduate students, 19.4 percent either agreed or strongly agreed that environmental efforts at UCSC addressed issues of race and class. “What we can infer is that the form of environmentalism that predominates UCSC’s campus either does not resonate with students of color and of low socioeconomic status, or does not make an adequate effort to engage them,” Pack wrote. During the caucus, people discussed how sustainability in their culture and household affected their identity growing up. The caucus and #POCsustainability campaign coordinator Adriana Renteria said that growing up as a Chicana taught her to never throw anything away. Her family often cooks together and has leftover tortillas that are saved to later cook chilaquiles. As a coordinator for #POCsustainability, Renteria works with the ethnic resource centers to show how people of color have been and will continue to be in the environmental movement, but it’s often difficult to gain momentum around the issue. Favianna Rodriguez is a printmaker and digital artist who uses abstract portraits and an explosion of vivid colors to comment on issues of globalization, economic injustice, immigration, war and social movements. Beyond her art, Rodriguez partners with social movement groups around the world and has co-founded Presente.org, a website focused on the political empowerment of Latina/o communities. Photo courtesy of Favianna Rodriguez. Fourth-year Dayton Andrews said he saw a lack of outreach to different spaces on campus, with the caucus having only 13 attendees. Creating the caucus is the first step, but there needs to be more outreach to the rest of the student body. Renteria said low attendance could mean students don’t feel safe on campus to speak out about these issues. She hopes there is a change in the sustainability culture on campus and more spaces will be created for students of color to support each other on these topics.